This is a sponsored post on behalf of Fellowes. 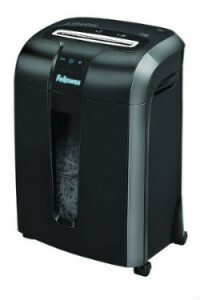 Well, Fellowes, Inc has just changed the shredding game with the new introduction of their Fellowes 73Ci shredder (which is now available as of Jan. 2013); they were the first to introduce personal shredders to the market way back in 1990 and they’re still going strong. The recent addition of the 73Ci has answered the common troubles and complaints most consumers have about shredders. First, and perhaps one of the best features, is that the shredder is 100% jam proof so it can handle big shred jobs but, in the event it’s too much, will kick back the documents so you don’t have to fiddle with the shredder from it locking up. Second, you need not worry about your delicate hands when they’re too close to the paper opening because the SafeSense technology will stop the unit before there are any unfortunate happenings. Third, you’ll save on costs with the energy saving system where it maximizes the power whether it’s operating or when it’s not in use (going green and keeping more money in your wallet never felt so good). Fourth, its touch screen controls brings the shredder into the 21st century which makes it intuitive to use so you’re not wrestling with it to get it working. Finally, the documents are shredded into 397 particles (the reasons!) so you can be sure that no document is going to be pieced back together any time soon (and you don’t have to worry about people snooping on your important, sensitive documents). The Fellowes 73Ci hit the market at a suggested price of $199.99 which will make it a lead contender in its category; its features will keep you delighted as you process your documents and it’ll be a perfect match for your needs. Which of the 73Ci features have you excited? Share a comment!